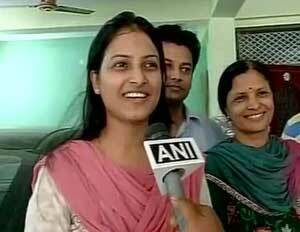 UPSC Civil Services Exam 2014 results gave us 4 girls in top five list. Delhi girl Nidhi Gupta secured rank 3. She is an excellent example of consistency and patience this was her fifth attempt but second success prior to this she was also selected in civil service in 2013 but not as an IAS. In an interview she mentioned that her efforts will be focussed on reforms and women empowerment. What she has been doing before she became IAS? In 2013 she was selected for Indian Revenue Service through same UPSC Civil Services exam and before joining in IAS she was working as Assistant Commissioner in Custom and Central Excise Department. Earlier She was working with a software company and but took a leave for her preparation for civil services. She had completed her engineering from Netaji Subhas Institute of Technology, New Delhi in 2009. Don’t need to be afraid of interview instead show your self confidence. Focus should be more on self study than coaching classes. Father: Her Father Mohanlal Gupta has been a government servant and working as a Director in Ministry of Rural Development. Mother: Her Mother Priyamvada is a housewife. Brother: Her elder brother is working with KPMG as financial advisor. How did you decide for yourself, that civil service is ‘the’ career for you? What were the initial apprehensions and reactions from people, after having taken the decision? Nidhi Gupta :When I was in college, there was this tiny thought in my mind to join civil services, but I took placements because I wanted financial stability and a backup option. While working at Adobe, I discovered that a sedentary cubicle job wasn’t my calling. That was when the thought of civil services as the medium of achieving my ultimate objective of self-satisfaction materialized. So, that was the time I quit my job and started preparing for civil services. There were apprehensions, but for any job you do, you have to take in the pros and the cons and decide on your own. There are several distractions(friends, social life, social network etc.) that one faces during the preparation? How can one combat them effectively? How were you self-disciplined during the preparation phase? Nidhi Gupta : To achieve any objective, self-satisfaction, discipline and dedication are the most important requirements. I was confident about what I wanted and knew that I had to nullify the deviations at my own level. During my time, WhatsApp and Facebook weren’t omniscient. But there were distractions in the form of chitchats/gossips. I found out that sometimes, even those random talks help you in terms of personality development. So, what it boils down to is how you manage your deviations and how you prioritize them with respect to time management. This is entirely a person-specific issue. What gave you the impetus to toil hard for five/six long years to prepare for the rigorous exam?How did you maintain the enthusiasm, motivation and temperament, while preparing keeping societal pressures at bay? Nidhi Gupta: Enthusiasm comes from self-motivation. I had the conviction that I have to reach my achieve my target no matter what happens. As I was more involved in my job at Adobe, I couldn’t devote much time to my studies as soon as I realised my true calling, I refocused my energy towards civil services. The UPSC exam requires a lot of inspiration and motivation which should come from yourself. Also, The UPSC exam lasts for a year, first the preliminary exam, then the mains followed by the interview? How can one keep oneself motivated throughout the year, for the twelve month process? Nidhi Gupta : It’s a long process unlike CAT or some other exam. But you have to understand the fundamentals, the spirit of UPSC behind this. The reason behind the length of the exam is actually the spirit of UPSC. The exam is, in fact, a test of your perseverance. Your ability to remain cool, calm and composed amid pressure is being checked, which is what is required of you, after joining Civil services. For senior players like you, what was the motivation to keep on revising the same material multiple times, keeping in mind that the revision gets monotonous after some time. How did you maintain the momentum? Nidhi Gupta : UPSC renews the exam curriculum every year. Some portions are added and some are removed. So, it’s not boring to revise. Some portions are, indeed, static but you just need to be conceptually clear with them. You just have to develop your analytical and logical skills, which is not boring for a person from engineering background. Considering the fact that at NSIT, an internship and a placement are the things, most of the people target, should one first test the water by working in an organization or pursuing further education OR straightway drop out of the college after final year and devote oneself completely to studies? Nidhi Gupta : This is again a very individual-driven question. In my case, I took up placements to pursue a small career in corporate life. Sometimes, the external factors are not conducive and you are not totally sure about your goals. One needs to take all factors into consideration before deciding upon anything. If you take my opinion, the most opportune time to go for civil services is right after college. But if you are not confident enough, you can enrich your personality in the corporate sector. Basically, you can take any of the three options but you have to be very clear in your goals. Shifting the focus to, how to attempt the paper and write answers. a) Should we have balanced answers adopting middle ground or take a stand? Nidhi Gupta :There is nothing like a perfect answer. Every answer has some positives and some negatives. Your answer should not only include the shortcomings but also focus on the real problem and its solution from all directions. If you are sure that you have thought about every aspect about the problem, take a stand else take a balanced approach. b) Is it desirable to add personal perspective in answers like in GS-4 and in essays? Is pitching in new solutions or perspectives to a problem advised? Nidhi Gupta :UPSC requires you to think innovatively. You will be at a position where you will influence government policies. If your solution provides an innovative mechanism to solve the problem, India would want you to come forward. So, if you have some innovative ideas, do write them. c) Please tell us about your approach/structure adopted in essay writing. Also tell us about the topics you chose and why? Nidhi Gupta : My topics were tourism and standardised tests in education. You must have a broad framework and should think about the impacts, influences, future problems, solution and any future innovations that could be incorporated. These things will make your essay quite holistic along with a text of 7-8 pages which is required. For e.g. standardised tests in education can be in professional fields, in medical fields or even in engineering and social fields. You could include their impact on culture, society, national and international affairs. You could also muse upon the requirement of standardised tests in technical fields and other areas. Moreover, you can always add some real life examples. d) People have various methods of starting their essays. And beginnings do matter. So, what was your approach in starting essays? Nidhi Gupta : It’s good to remember a quote. It’s good if you end with a strong positive message. But it is not necessary. Everyone is not going to write quotes in the beginning. And, you can always make 2 line quotes on your own. If you are writing facts, ensure that it is word-perfect. Basically, you should start with something that will impress the examiner. Nidhi Gupta :If you consider the different reports, committees and the different recommendations, your answer will have a certain depth. However, this is not the foundation of your answer. The foundation is the concepts on which you will base your answer. Your presentation also matters. You can impress the examiner only if you write in an innovative mechanism. You can consider any number of sources available at your disposal. You just have to write in a way, which is not boring for an examiner to read and also doesn’t sound like it’s taken right out of some book. 6. During preparation, considering changing trends of UPSC, how should an ideal candidate customize his/her strategy to make their thinking more analytical and dynamic? Nidhi Gupta : There has been an evolution of the questions in the UPSC exams. If you consider the previous year papers, you will observe that the questions have become more analytical. Analytical skills will come to you think about all the relevant ‘whys’. The thinking horizons need to be widened and research on various facets of an issue needs to be done. Only then will you have a holistic answer. Please elaborately explain what all factors are considered while filling cadre and services preferences and accordingly how have you classified cadres and services on those parameters when you filled the DAF. Nidhi Gupta : The spirit of UPSC tells you to work hard. If one is dedicated towards his/her own work, these factors no longer hinder you. It all depends on what you want. If you wish to work on development, BIMARU or Naxal states are open for you. Political issues should also not be a criteria for judgment. But, language is an important criterion as language propels you to work better. Regarding DAF as a whole, DAF filling is important because it determines how your interview will go, to some extent. One just needs to be honest in the DAF and good things will succeed. Please tell us about 1) overall revision strategy, 2) last month revision strategy, 3) Last week revision strategy and 4) Last day revision strategy , you guys adopted ? Nidhi Gupta : For optionals like physics, prepare handy notes. For e.g. if derivations are there, you can start off with the name of the scientist, some fundamentals of the derivation and the end result or some specific condition you have considered for the derivation. For the last week and the last day, revise the basic formulas. For GS, concept clarity is required. On the last day, just brush up on some events which took place in the last month or so along with a few facts on international affairs. Many people face anxiety, restlessness, and sleep issues a night before their prelims and mains exam. Have you faced them? How did you overcome such problems? Nidhi Gupta :Anxiety is very common for a normal person. But if you are thorough and confident, you will be able to overcome that anxiety. So, just be relaxed, calm and composed. If you have been consistent with the preparation for the last year, that confidence will develop in you and sleep will tag along. Sleep is very important especially in mains. So, if you don’t sleep on one day, you end up messing the whole thing. a) What role do co-curricular activities, projects and internships play in the interview? Nidhi Gupta : The interviews wish to know whether you are a balanced personality or not. Your academics have already been tested by the prelims and the mains exams. Your leadership and management skills, reflected by your co-curricular activities, are checked. It is just a test of your personality. There are people in IPS, IRS. How do you defend yourself in front of the panel? Nidhi Gupta: This question was asked to me at one of the interviews. Here, your clarity of thoughts is being checked. You should think of the things you can do as an IAS officer and the opportunities that an IRS lacks. But you should also think about the positives you are bringing from your previous job. b) Please explain the factors viz. candidate body language, mind-set, knowledge , confidence, ability to handle pressure situations etc. interviewers consider while judging a candidate. Any special trick or measures you adopted to improve any of these? Nidhi Gupta:Knowledge is, of course, not tested in the interview. The things mentioned above make your personality. But the main thing they look to is if whether you are willing to serve the weaker sections. This is reflected by the thoughts you communicate. So, personality development at the thought level is being checked. c) What role does work experience in 1) branded private companies, 2) Start-ups, 3) Government services play? How can a candidate with no work experiencehandle the interview? Does a post- graduation from a reputed school supplement your personality? Nidhi Gupta : Every day is a new experience. Be it a stint at a start-up or a job at a private or a government company, every small thing brings out your true self. All these things make you feel more confident about communicating since you have experience interacting with so many people. That does give you an edge but it is not the sole path to success. What was the reason you chose Geography and Physics as your optional subject respectively? How should one go about selecting one’s optional subjects? Nidhi Gupta :I chose physics because I thought I could carry it for 2-3 years as I had an interest in it. My strategy was to choose an area where the interest lies. Previous articleSmita Sabharwal is an IAS Officer of Andhra Pradesh cadre. I am just confused about government jobs (higher post jobs) vs entrepreneurship (start-ups). I want to become an entrepreneur but my parents, friends, relatives, etc. always demotivate me and tell me to do job. But why should I do job as it is not necessary to go with the system. Can you please help me in this matter? Dear Ravi , it is very important that to have a good command on english as it is a compulsary subject and when you face interview english is your base . So keep going with english , without this upsc is not for you..
You should not demotivate someone like this. You should listen to English of Haritha v Kumar and Gaurav aggarwal. You will yourself get the idea what UPSC is all about. You know what? Before pointing out someone else’s mistake you need to focus on your’s own first. Let me tell you that your comment contains a grammatical mistake. Good luck and please don’t take my words rudely. He should write an IAS…right?? How can you be an IPS officer?? you are too weak in your english. you are too weak in english. He wrote Command on English instead of Command over English. And I urge you all to stop behaving like little kids, and belittling each other. Keep Focused Keep Motivated.
. I’m writing UPSC in this year.and I’m giving preference to IAS only than what type of steps to take for IAS exam.give some clarity about this exam. I am appu natikar as am working with capgemini as financial advisor since 2 year,initially I was having so.much of interest to clear the ias exam unfortunately I could not able to write the exam but still I am interested to write exam,could you pls advise me how to prepare for the.exam and what are books I.need to refers for exam? You can give upsc in any language. My only question from every aspirant , mentor or expert out there is, is it really necessary to refer different books for a single topic or one should go for single book and revise the same material again and again.? I should go for landmark books or should I settle with books with same material but by different authors? Dear….. IASes …..plz explain….difference between UPSC and IAS exam…..i’m fully mad…..
im studying now BE 3rd yr …plz any one explai clearly…. exam hota h upsc ka ( union public service commission) ….means upsc ek commission h jo ye exam conduct krti h ..and jo log ye exam clear krte hn un logo ko rank ke according post milti h ..
sdha sa mtlb ye h ki upsc exam hota h and IAS us exam ki ek post ….jo top rankers ko milti h .. Very inspiring n useful interview…..thanku so much. Jay hind. Can I prepare myself for IAS at home without coaching…. how I start my preparation… plz help me. How can I become an IAS ????? I belong to Humanities stream and my math is weak. Plz advice me in this regard. Thanku…………. sir, I really want to become an IAS officer . plz help me preparing for exam . mean how I should start my study. I’m want become I.A.S.officer ! But my English is very weak .so plz tell me any solution of it.either I focus on my weak zone e.g not good in English or i focus on my goal,plz help what i do? Hi My Name is Ravi ,i am not so good in english ,m dull in english,can i acheive all this,but i have belief in myself. i am from hindi backround but my dream is to become a govt officer but i never give up.i face many problem and my main problem is english ,can i do this all…? I’m thinking of appearing IPS exam and i’m confuse which book to read or go through, so can you please suggest me some books. i’hv passed 12th nd i’ m doing BE frome AIST SAGAR nd I promiss u …..all of u read my interview on this page …..
Thnkx mam…ur great thoughts and ur spirt in the interview impressed me alot to become an IAS officer like u….. Some people says grammar is very important but you know what even upsc interview panel will not able to write essay’s without grammar mistake. What really important is to write meaningful sentence and avoid notable mistakes that can easily be identified. So guys, especially for those who feels that I am not well enough to express his/ her thoughts, I would suggest you to just practice as much as you can and try to observe the mistakes that you have made during your writing’s. Avoid listening baba ji’s views…. Sir I passed 12th cllass from science. Hey friend! I also had the same question.Some people suggested me to opt for BA. But I choose The one in which I was interested i.e. Biotechnology. And if you are still confused in desciding I will only advice you take only that subject in which you have interest and don’t think upon what other says about you. It is you who have to take the action not they. And if you have heartiest desire for civil service beyond the limit believe me you can get it because you deserve it. and pls don’t try to spot grammatical mistakes in above. I have completed my BSC in 2014, i am too interested in Civil Service but after completing my Graduation i was not able to work on my goal because of my financial conditions. Then i start to work in an Corporate Organization but now i am soo worry i really want to prepare for Civil Service.. I need a better idea how should i overcome from this and all and how would i start to work towards my real goal. Please give me better advise? In any way I need your advice to help my fellow citizen……. Many dream, some try and only a few achieve. You are an achiever today. Congrats NIDHI on this special achievement!! Keep up the good work and remember that sky is the limit to your achievements. Actually I really want to become a civil servant.Am sure if we work hard we can get. But I don’t know how to prepare and from where to start.